Kolkata, June 17 : State-owned Dena Bank would focus on West Bengal, Haryana and Punjab by opening more branches in the three states to grow its business, a top bank official said Monday. "Our strategy would be to focus on particularly two to three states and grow business there. West Bengal is one of the focus areas. Then we are opening branches in Haryana and Punjab," Dena Bank chairman and managing director (CMD) Ashwani Kumar said here. Kumar said West Bengal was a good current and savings account (CASA), and SME belt. Chennai, April 13 : Government-owned Dena Bank plans to expand, opening around 175 branches and adding around 560 automatic teller machines (ATMs). It is hopeful of over Rs. 600 crore fresh capital infusion this year, a top official said Saturday. "We plan to open between 150-175 branches and add around 560 ATMs this fiscal. Presently the bank has around 570 ATMs," Ashwani Kumar, chairman and managing director, told reporters here. Kumar said the bank had asked the government for additional capital infusion of around Rs. 1,260 crore. Indian Stock Markets continued in the positive territory on Thursday as the US markets gained smartly on Wednesday. Stock prices of Gold Loan companies witnessed huge demand after reports of loan valuation for gold ratio increase to 75 per cent. JSW Steel has increased price of all steel products of the company. The stock price was higher in today's session. Maruti Suzuki and M&M witnessed higher sales during December compared to other auto majors facing tough times. Veteran banker Ashwani Kumar has taken over as chairman & managing director (CMD) of Public sector lender Dena Bank, effective January 01, 2013 for a term of five years. Mr. Kumar owns a rich banking experience of more than three decades serving. Before joining Dena Bank, he was serving the Corporation Bank as its executive director since December 01, 2010. Prior to that, he served Allahabad Bank. Private sector bank, Dena Bank has announced that it has removing a processing fee on housing and car loans for its customers. The bank said that it has waived off the entire processing fees on for housing and car loans and half of the processing fee for personal and gold loans for borrowers. The bank said in a statement that the offer is valid until 31 December, 2012. Technical analyst Salil Sharma has maintained 'buy' rating on Dena Bank stock with a target of Rs 114. The analyst said that the investors can buy the stock with a stop loss of Rs 105. The shares of the company, on April 11, closed at Rs 107.50 on the Bombay Stock Exchange (BSE). The share price has seen a 52-week high of Rs 151 and a low of Rs 78.15 on BSE. Current EPS & P/E ratio stood at 20.63 and 5.25 respectively. Dena Bank's March 2011 growth stood at 24-25%. Technical analyst Nitin Murarka of SMC Global has maintained 'buy' rating on Dena Bank Limited stock with a target of Rs 107. Mr. Nitin said that the stock can be purchased with a strict stop loss of Rs 96. The stock of the bank, on March 24, closed at Rs 99.60 on the Bombay Stock Exchange (BSE). The share price has seen a 52-week high of Rs 151 and a low of Rs 78 on BSE. Current EPS & P/E ratio stood at 20.63 and 4.87 respectively. The latest reports issued by IIFL maintains 'buy' rating on Dena Bank stock with a target of Rs 106. On March 7, the stock of Dena Bank opened at Rs 97.25 on the Bombay Stock Exchange (BSE). The share price has seen a 52-week high of Rs 151.00 and a low of Rs 77.50 on BSE. Current EPS & P/E ratio stood at 20.63 and 4.62 respectively. According to reports, the lender has staged a sharp recoil from the help of its 20-DMA this week. In the last week, the stock broke out from the sliding sloping trendline with higher-than-average volumes. Stock market analyst Prasad Kushe has maintained 'hold' rating on Dena Bank Limited stock to achieve a target of Rs 175. According to analyst, the interested investors can buy the stock with a strict stop loss of Rs 122. The stock of the company, on Nov 08, closed at Rs 143.95 on the Bombay Stock Exchange (BSE). The share price has seen a 52-week high of Rs 145.80 and a low of Rs 64.80 on BSE. Dena Bank has registered an increase of 28.88% in its net profit for the three month period ended September 30, 2010. Stock market analyst Manoj Sachdeva of Hem Securities has maintained 'buy' rating on Dena Bank Ltd stock with target of Rs 114 in 3-4 trading sessions. According to analyst, the interested investors can buy the stock with stop loss below Rs 102. The stock of the company, on Sep 01, closed at Rs 105.40 on the Bombay Stock Exchange (BSE). The share price has seen a 52-week high of Rs 112.40 and a low of Rs 51 on BSE. Current EPS & P/E ratio stood at 18.65 and 5.77 respectively. Dena Bank is all set to make entry in the syndication biz. 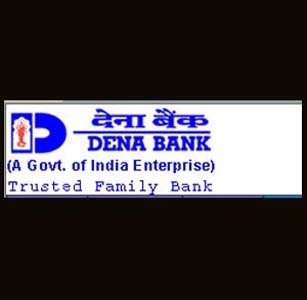 Public sector lender Dena Bank has declared its financial results for the first quarter of the fiscal year 2010-11. According to the report, the bank has registered a significant 21% net profit rise in the quarter under review. Dena Bank has reported that the net profit of the bank stood at Rs 138.79 crore for the quarter that ended in 30th June, 2010. The company has registered a net profit of Rs 115.02 crore in the same quarter in the previous fiscal year. This has been informed by Dena Bank in a filing at the Bombay Stock Exchange. Dena Bank announced a rise of 20.67 per cent in its net profit for the first quarter ended on June, 30, 2010. Net profit of the public sector lender stood at Rs. 138.79 crore for the quarter. The bank had reported a net profit of Rs. 115.02 crore during the corresponding quarter in the previous fiscal. Total income of the bank surged 8.72 per cent to Rs. 1,221.78 crore from Rs. 1,123.82 crore in the year-ago period, the bank said in a filing to the Bombay Stock Exchange. Stock market analyst Kunal Saraogi has maintained 'buy' rating on Indian Bank stock to achieve an intraday target of Rs 99. According to analyst, the investors can buy the stock with stop loss of Rs 88. The stock of the bank, on July 08, closed at Rs 92.70 on the Bombay Stock Exchange (BSE). Current EPS & P/E ratio stood at 17.82 and 5.27 respectively. The share price has seen a 52-week high of Rs 96.80 and a low of Rs 46 on BSE. Dena Bank, on July 01, stated that it has decreased the interest rates on non-resident external and foreign currency non-resident deposits. Stock market analyst Rahul Mohinder is of the view that investors can buy Dena Bank stock with intra-day targets of Rs 97-102. The shares of the bank, on June 23, closed at Rs 94.10 on the Bombay Stock Exchange (BSE). The share price has seen a 52-week high of Rs 95.45 and a low of Rs 46 on BSE. Current EPS & P/E ratio stood at 17.82 and 5.38 respectively. The analyst said that Dena Bank is a profitable option. Stock market analyst Rahul Mohinder is of the view that investors can buy Dena Bank stock with stop loss of Rs 88. According to analyst, the investors can buy the stock for 10-15% upside in two days. Today, the shares of the company opened at Rs 92 on the Bombay Stock Exchange (BSE). The share price has seen a 52-week high of Rs 95.45 and a low of Rs 46 on BSE. Dena Bank has heightened its focus of on high margin products that comprise advance to SMEs. As the last financial year has been fruitful for almost all the private and the public insurance companies but Bajaj Allianz has been the frontrunner in the race. In fact, the success gained in the past year hasn't really bought complacency in its approach rather the insurer is aiming to strike gold this fiscal. And the recent deal under which the Private sector insurer Bajaj Allianz Life Insurance today signed an agreement with public sector lender Dena Bank for the distribution of an insurance product can be considered as one of the first steps in that direction. Technical Analyst Salil Sharma has maintained 'buy' rating on Dena Bank stock to achieve an intraday target of Rs 88. According to him, interested traders can purchase the stock with a stop loss of Rs 81. The shares of the company, on May 04, closed at Rs 84.30 on the Bombay Stock Exchange (BSE). The share price has seen a 52-week high of Rs 93 and a low of Rs 37.60 on BSE. Current EPS & P/E ratio stood at 17.82 and 4.63 respectively. Dena Bank is eyeing a loan growth of 22-24 percent in the current financial year. In his latest research report, stock market analyst Ashwani Gujral said that Dena Bank can give good returns in the short term. According to Mr. Gujral, the stock of the company can be bought with a strict stop loss of Rs 73 to achieve a target of Rs 110. Today, the shares of the company opened at Rs 81.80 on the Bombay Stock Exchange (BSE). Current EPS & P/E ratio stood at 17.13 and 4.68 respectively. The share price has seen a 52-week high of Rs 80.80 and a low of Rs 25.10 on BSE. The administration may look to unite Dena Bank with Canara Bank as part of its banking consolidation plan.